Albert Einstein once said that imagination is more important than knowledge. The ability to extend the boundaries of what is real is the provenance of art, and is the central theme of the Magical Thinking opening. 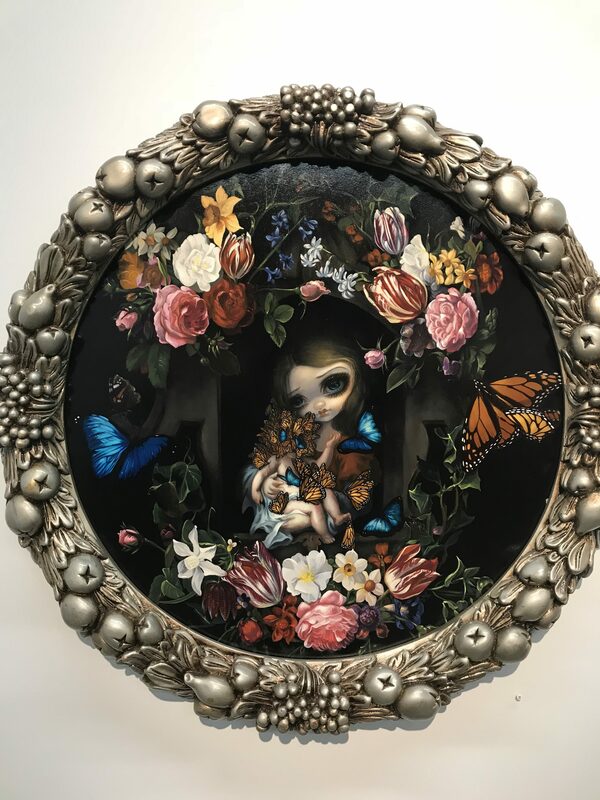 Ms. Jasmine Becket-Griffith is able to unravel a fantastical land which covertly is connected with our own reality to passionately affirm that to dream is to be human. The exhibition houses approximately two dozen fastidious paintings which by itself demonstrates an artist comfortable with her mastery. While it is laudatory to showcase such rarefied skill, fine art is advanced when the artist has the daring to make a positive claim using her gifts. Otherwise, the art is immobilized in the shadows of kitsch, of being pretty for its very sake. This is, however, clearly not the case here. On first glance we have a fantastical universe, very much consistent with an innocent nostalgia that has been appearing on the contemporary Los Angeles art scene. A recrudescence of childhood naivety, which captures the juvenile hopefulness that is loaded with the potential energy of possibilities brought by youth, has appeared so consistently to perhaps counter or quell the anxieties of living in such a turbulent digital age. Its counterbalance is to restore a sense of optimism about the future despite the historical “rough air” being encountered. Yet upon closer examination with this exhibition, we are not dealing with a fantasy completely severed from reality as other artists in this movement have more overtly fulfilled. And most strikingly brilliant is a soteriological dimension to this world. This is imaginatively accomplished in the magnum opus of the exhibition: Dress of Sinners, Dress of Saints. Children tend not to be so existential as to imagine the humanistic qualities to fiction! That these dream-girl dolls have a spiritual dimension (irrespective of the Catholic parallel), that they possess religiosity, is marvelously original. It beckons the thought that fantasy, indeed all fiction, to better correspond to the human condition, must possess a tensile resolution to the uncertainties of living a human life which religion has historically fulfilled. And what of the dreams of these doting girls in finery? Are they worthy of imagining? The keystone to the exhibit provides us an answer. In a rather cryptic yet articulate manner, Unseelie Court: Sloth is able to synthesize the apparent and wondrous fantastical with the sobering realistic. Disregarding the place of the dream-girl in this time capsule, her disappointment of what the world is compared to what it can possibly be is visceral. And it is this galvanic force which is latent to youthfulness; to release it is to release human potential, upwards and onwards, rather than to a crude material below.